Marshall & Polk Rural Water System offers a wide variety of convenient payment options for our customers. Simply choose the option that best suits your needs. 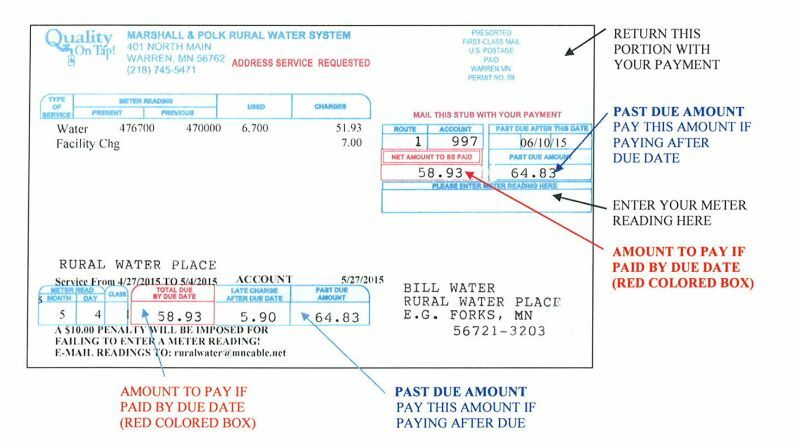 You may pay your bill in person at our office located at 401 North Main Street, Warren, Minnesota. We accept cash, check, or money orders. To avoid longer wait times, please note that Mondays, Fridays and the first day after a holiday are normally very busy. Enter your Account # or Service Address. You will be redirected to an online secure PayPal payment page.